New flagship unit boasts 108 digital amp models, 164 effects and more. 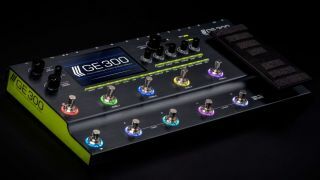 Mooer has announced the GE300 multi-effects processor, which the company says will be its new flagship model. The unit, which will be unveiled at the 2019 Winter NAMM show, sports 108 digital amp models, 164 effects and 43 pre-loaded optional factory cab sims, as well as a full-featured IR loader capable of hosting impulse responses that can be up to 2048 sampling points each. The GE300 also features a synth engine—a tri-voice polyphonic synthesis module that can transform the guitar into an electronic synthesizer without the need of special pickups or instrument modifications. Each voice has options for wave form, pitch, filters and arpeggiators. There’s also Tone Capture, which boasts three different modes—"Amp,” which samples and captures a real-life amplifier; “Guitar,” which capture the EQ characteristics of the user’s instrument; and “Cab,” which provides an all-in-one solution to sample speaker cabinets and create IR files. Other features include 10 customizable footswitch controls, programmable stereo effects loop, 30-minute looper station with storable loop sessions, external device switching and direct USB audio. For more information, head over to Mooer Audio.